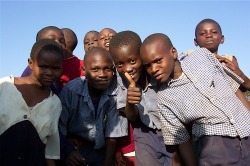 Some of our longest running partnerships have been with Nyakasumbi Primary School and Bondo Township Primary School. Back in 2007, quite literally in our hands and knees, we worked together with the students from Bondo Township to clear their grounds from stones and thorny bushes, enabling them to mark out a football and netball pitch. Following this, we provided teh school with metal goalposts. Since then, the pitch has become an integral part of the Bondo community, both for local schools as well as for the local adult community teams. In 2009 we also provided Nyakasumbi with goalposts for their sports pitches. With Bondo Township and Nyakasumbi up and running with their pitches, we have worked to help facilitate regular inter-school fixtures and health education talks during term time, providing balls, team kits and other sports equipment. Currently, the trophies are taking pride of place in the headmaster's office at Bondo Township, but they won't be there much longer if Nyakasumbi have anything to do with it!